Sapa is not only famous with the stunning landscape, terraced rice fields, but alo famous with for local markets weekly which giving travellers an authentic experience of the local hill tribe culture about their customs, daily life and traditional habits. Here is list of local markets in sapa you may wish to consider visiting as part of your Sapa Trekking Tour. This is a colorful market in a mountainous area northern Vietnam, where the Flower H’mong mainly gathers to exchange their homemade products. It’s coming for every Tuesday, it starts around 7am and closed in the early afternoon. Muong Khuong market is far away 90 km from Sapa. It opens on every Sunday and considered as the biggest of the minority here. Local peoples from everywhere of Muong Khuong’s land coming here to get gather in selling and trade from cattle, vegetable, handicraft, traditional incense and local products. Lung Khau Nhin is small market, near Muong Khuong town and is habitant place of the Black Dao, Tay, Flower H’Mong (Red H’mong), Dzay minority group. This is alo a place that people selling brocade, dresses and blankets as well as dogs, cats, pigs and chickens. Lung Khau Nhin market held every Thursday starting around 7.30am – closes in the early afternoon. Cao Son market has only meeting on Wednesday, this is the market of ethnic H’Mong, Phu La, Han and Black Dao, who living in 4 biggest villages of Muong Khuong. A Sapa Trekking Tour that including Cao Son market will have a great opportunity for you to interact as well as learn more about the daily life of ethnic where you also will easily be overwhelmed by some cuisines from flavors of buffalo meat, beef meat and horse of the H’Mong peoples. Simacai Market as well known as one of the remote tribal market of the region. 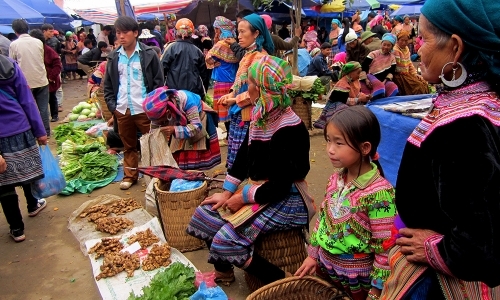 It’s rarely have the visit of visitor as other market in Sapa, this is because this market often holds in the mountains and forest at the far end of a tough road. Just few kilometers away from Chinese border, coming to Pha Long market takes 3 hours from Sapa. This market is very rural and seldom visited by tourists.